In interview, secretary general dismisses concerns about Russian belligerence. Less than two weeks ago, NATO Secretary General Anders Fogh Rasmussen heralded a “true fresh start” with Russia at the Lisbon Summit, after the former foe agreed to end its longstanding opposition to NATO’s plans for ballistic missile defense. But the Kremlin is now talking about a different “fresh start.” Both Russian President Dmitry Medvedev and Prime Minister Vladimir Putin have warned of a new arms race if NATO doesn’t accept the Kremlin’s vision of a missile defense system and the United States doesn’t pass a new nuclear-arms agreement. “Unidentified U.S. officials” were quoted in the Wall Street Journal as saying Russia has recently moved tactical nuclear weapons to the Kaliningrad region, an enclave bordered by NATO members Lithuania and Poland. Still, Rasmussen's view is persistently optimistic. 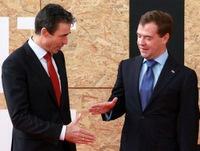 “We are on the right track towards a very positive relationship between NATO and Russia,” he said. The gulf between those positions when it comes to missile defense will soon become evident. A NATO-Russia Council meeting next week will start getting into the practical details of how missile-defense cooperation would work between NATO and Russia, with a view toward having an outline ready by the time ministers meet again in June. But Russian officials maintain they are talking about a single shield, encompassing Russia and the 28 NATO allies. A NATO source told GlobalPost that the alliance’s concept is definitely two separate systems linked together. But there’s another kind of “start” causing tensions too, and the Russians aren’t the problem. The U.S. Senate is holding up ratification of the START treaty, a plan worked out between U.S. President Barack Obama and Medvedev to reduce deployed nuclear weapons in each country by 30 percent over the next seven years, down to a maximum of 1,550. It also includes mutual verification measures, which have not been in place since the previous START expired almost a year ago. Obama calls the treaty one of his top foreign-policy priorities; Senate Republicans say it’s not pressing for them, despite appeals from Defense Secretary Robert Gates, former Republican secretaries of state and other diplomats worldwide. The Kremlin is tapping its foot impatiently and threatening to build up its arsenals if the U.S. does not quickly agree to the dual drawdown. This is something that does have Rasmussen “very much concerned,” he said. “It may have very far-reaching consequences not to ratify the START treaty or to delay significantly the ratification of the START treaty,” he warned. Rasmussen wants the long-range reductions underway, hoping short-range nuclear weapons would be the next ones cut back. “That would be of the utmost importance for countries in Europe,” he said. Rasmussen declined to answer the question of whether Belgium, Germany, the Netherlands and Turkey — confirmed by new WikiLeaks disclosures to be among the hosts of U.S. tactical nuclear weapons — would likely be the countries most directly affected. Belgium, Germany, Luxembourg, the Netherlands and Norway sent Rasmussen a letter in February asking him to elevate the matter of nuclear policy within the alliance. German Foreign Minister Guido Westerwelle, among others, has publicly demanded all nuclear weapons be removed from Germany, but State Department documents released by WikiLeaks quote German National Security Adviser Christoph Heusgen opposing that view in a meeting with U.S. diplomats. The secretary general wouldn’t address that or any other information contained in classified documents, he said. He joined the long list of prominent figures lamenting the WikiLeaks exposure of tools and methods for conducting international relations. In a post-WikiLeaks world, more fresh starts might be required.